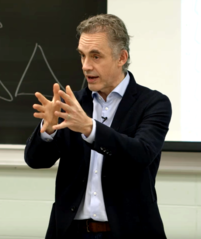 The Illuminati honored controversial Canadian professor Jordan Peterson at a ceremony held at the Bolingbrook Golf Club. File photo of Jordan Peterson by Adam Jacobs. Deputy Mayor Michael Lawler performed the glowing orb ritual for Peterson, then presented him with a medal. It was Lawler’s first time performing the ritual, and Mayor Roger Claar, who was in the audience, nodded in approval. Peterson wiped away tears as he accepted the award. “I shouldn’t have cut onions before the ritual,” said Peterson. The gathered officials laughed. Brilliant! How do I up-vote this? There isn’t an upvote function here, but please feel free to share the link to this story. That will really help me. Thanks.